Longside travelled to the Granite City on Saturday to play Aberdeen University in the McBookie.com First Division East. Straight from the kick-off the home side’s Edwards burst through and Bain made a brilliant tackle to stop him. The home side took the lead in 23 minutes when an Edwards shot was saved by Cowe but Neil Moir followed up to score. A minute later Mackie played the ball into Fraser Davidson but he fired his shot over the bar. A Caswell shot was deflected by Findlay for a corner, Fletcher’s kick was cleared upfield. Caswell had a great chance for University when he was presented with an open goal 15 yards out but he fired his shot over the bar. Just on half time Wallace won a corner for Longside, Mackie’s kick was well saved by McKendrick as Fraser Davidson was waiting to pounce. Just after half time Fraser Davidson seized on a poor clearance from McKendrick but his shot went just over the bar. Cowe made a great save to deny Moir as the forward got himself into a good position. Spence tried a shot from 30 yards but his effort went well wide. Longside made a double changed with Marshall and Mackie being replaced by McIntosh and West. Wallace tried a shot from the edge of the box but his effort went wide. A McIntosh cross was headed on by Fraser Davidson for Glendinning but he poked his shot over the bar. 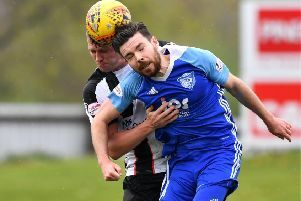 The visitors drew level with 70 minutes gone when Fraser Davidson sent Glendinning clear and he got to the byeline and his cross was put into his own goal by Vincent Docherty. University were awarded a penalty when McIntosh was adjudged to have fouled Neil Moir in the box and he dusted himself down before making no mistake from the spot. A minute later the scores were level again when Longside were awarded a free kick 25 yards out, Danny Glendinning fired it into the net. Both teams created chances in the closing stages but their was to be no further scoring. This Saturday Longside are in Aberdeen once again, this time to play Glentanar in the McBookie.com First Division East with a 2pm kick-off.